This, our third spring in Texas, has been the loveliest by far. The weather has been cooler and we have had substantial rain right when our spring garden needs it most. The gardens look the best they ever have, and it’s all very exciting. It’s heating up now, but we’re still eating a few peas, chives, and these black Spanish radishes. I had never heard of such a thing until I saw a chiropractor who actually recommended I take it in pill form to fight an infection. 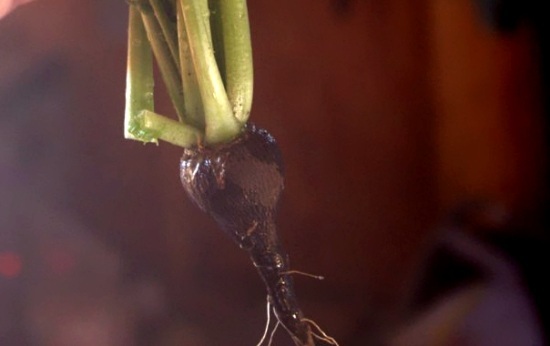 A radish that doubled as medicine? I was intrigued. So, this spring we planted a small bed of them and they turned out great. They’re not that different from your red globe radishes, but they aren’t exactly the same either. I thought I’d share how we’re cooking with them and what makes them so unique. The larger, more mature radishes are a bit woodier than their younger counterparts. Most of the woodiness can be found in the outer part of the radish, and can therefore be peeled away with a knife. Peeling them seems to help bring down the kick a bit, if you’re serving them in a salad. The younger radish leaves are delicious when added to a salad. The more mature ones got a bit prickly, but made a fine addition to frittatas and other cooked dishes. These can, and should, be eaten raw in salads. They pack a whollop so one or two in our lunch salads worked well. Our toddler picked them out, but she’s kind of weird like that. I simply wash, trim, and chop them for this type of dish. Because they are woodier and spicier than the average radish, they work great in cooked dishes as well. They are similar to a turnip, I find. Roasting them mellows them out a bit and the addition of butter greatly enhances their edibility. Finally, don’t forget the greens. If you aren’t composting them or feeding them to your chickens, try eating them! They have a lovely flavor when young and are much like other cooking greens – slightly bitter – when more mature. These Black Radish Chips look like a great way to flavor them up, as does a fermented Black Radish kimchi, which I will have to try come fall if we get another succession of these planted. Now it’s your turn! 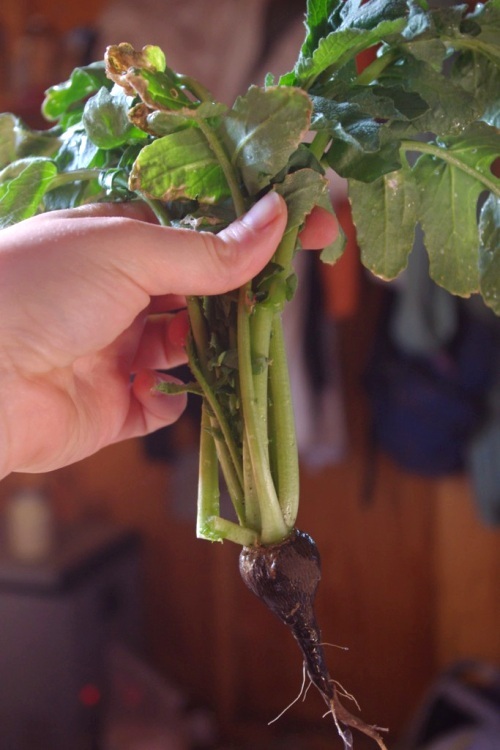 Have you worked with Black Spanish Radishes?